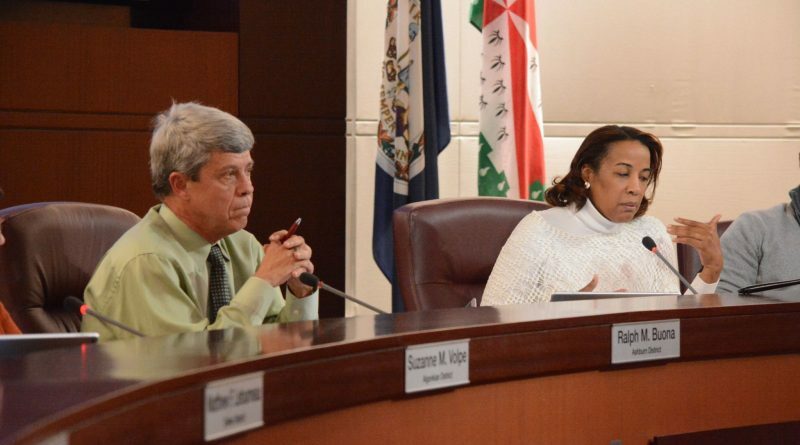 Loudoun County Chairwoman Phyllis J. Randall (D-At Large) has promised that she will create a Commission on Women and Girls from her own office after that commission was voted down by the full Board of Supervisors on Tuesday night. The idea for the commission has received an outpouring of support at public hearings, but Randall said she went into the meeting knowing it would not pass the full board after discussing it with other board members individually. “The citizens, most especially the women of the county, said that they wanted this,” Randall said. Republican supervisors argued that the Commission on Women and Girls did not fit into the mission of county advisory commission. 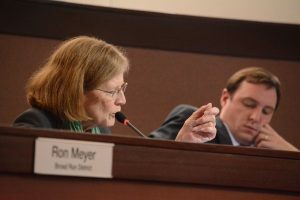 “It seems like something that wasn’t necessarily focused on [providing] advice on specific policies, but instead more a leadership group that would try to recommend things to the greater community outside of our government,” said Supervisor Ron A. Meyer Jr. (R-Broad Run). He said he applauds Randall’s decision to run the commission from her own office, and was one of the Republican supervisors Randall credited with the idea to handle it that way. “At the end of my term, just like it would have been no matter what, it is my hope that I could pass this on to a private entity,” Randall said. “Because I actually think the role of government right now is to be a place that brings all these disparate groups together,” referring to private organizations in the community that promote women’s issues. Randall said she would have preferred to create the commission with input and involvement from other supervisors. The motion to create the Commission on Women and Girls failed on a 2-6-1. Only Randall and Umstattd voted yes. Supervisor Koran T. Saines (D-Sterling) was absent. Two powerful women, decrying that women are second class citizens, in a county essentially run by …women. You can’t make this up. The people, including plenty of women, want to know when horrific traffic congestion around Leesburg, Purcellville, Waxpool Rd., Syclon Road, etc. will be not only be addressed, but remedied. We want to know when our tax dollars will not be wasted by overpaying for land for schools. Women want to know when they can send their daughters to a bathroom at upscale One Loudoun, without having to worry if they’ll be accosted by sexual predators with prior sexual convictions. Mom’s want to know if they can send their sons to school, without having them gunned down by MS-13 gangs. Surely, there must be more pressing, real life, issues that need your attention, and our tax money. . I hope Chairwoman Randall will reconsider establishing this non-essential Panel. I read the “justification” for this endeavor and thought it read like something simply cut and pasted from a variety of “studies.” There were no clearly articulated issues that needed to be addressed and no clearly outlined goals, which left me wondering, why bother. Women are underrepresented at all levels of government—by thirty-three percent on the current board of supervisors of the county, by fifty percent in the General Assembly of Virginia and other state legislatures, by eighty percent in the offices of the governors, and by fifty percent in the Congress. No woman has ever held the office of President of the United States. No women has ever held the office of governor of Virginia or the office of lieutenant governor of Virginia. Once only have the people of Virginia elected a woman Attorney General of Virginia. But wait, Phyllis Randall plead in federal court that she had no official duties other than those assigned by the entire board. She even claimed her “Chair Phyllis J Randall” facebook page was personal because the BOS didn’t authorize it. Now, she claims she can use county facilities and funds to allow the establishment women of Loudoun to get together and seek publicity. Echoes her comments from last year when she wanted to increase the public relations budget because “they make us look good. What a waste of money. 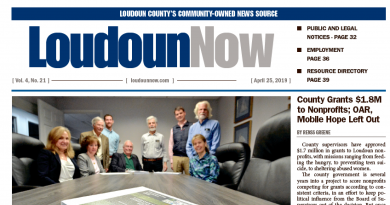 At least the young girls of Loudoun have one female role model in that board – Volpe. Maybe we could also have a Commission on Dogs as well as a Commission on Cats. What about a Commission on Commissions and a Commission on Cats?